Seiko developed kinetic technology that generates electricity from movement caused by the wearer's arm. They are very accurate and reliable. 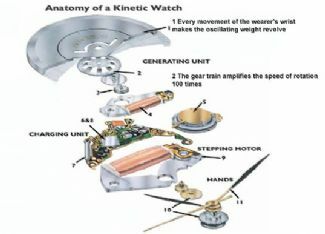 The kinetic system is based on a rotor spinning at high speed. Each Seiko timepiece has a small capacitor storing an electrical current, which is released when the watch needs to be powered. This stores electricity that powers the watch when it's not on the wrist. Kinetic watches operate for up to six months if not worn at all once fully charged. Simply wearing the watch again will charge it again.